Which subtypes are valid for Panchatantra to give to ice? Does the Runner have to choose a subtype on a rezzed piece of ice? Any subtype is valid. Subtypes are not specific to a particular card type, and you don't have to choose one from rezzed cards. 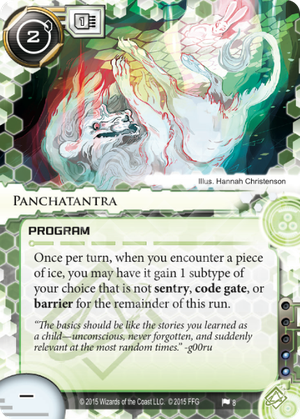 Can the Runner make up a subtype to give ice with Panchatantra? Another card to add to the Shaper I-can't-pronounce-this-card page in your binder alongside Paricia and Sahasrara. Although maybe you want to add it to the confusing-as-heck part of the Shaper arsenal, alongside Analog Dreamers and False Echo. But today I'll make a case that actually you should take it out of the binder completely and instead run it in YOUR deck. But first, don't make the mistake of a rookie friend of mine: just because the ice has the subtype "Bioroid" now, doesn't mean you can spend a click to break a subroutine, nor will newly annointed "Traps" trash themselves upon firing. Also, subtypes are different from types, which means that you can't turn ice into assets and trash them with Imp or any nonsense like that. Some of you might even be thinking of Unregistered S&W '35, but ice are not installed in servers so your dreams of shooting Eli in the face will have to wait for another day. In reality, there's 3 subtypes that are worth naming: AP, Destroyer, and Tracer. That's because as of this card's release, the only cards that gain benefits from ice with a subtype that is not Sentry, Code Gate or Barrier are Deus X, Sharpshooter and Gingerbread, although I'm sure they'll be joined by at least a couple more cards in future. While it's nice to see Gingerbread find a purpose in life, it's the disposable breakers that are really exciting. Between Deus X and Sharpshooter, most large ice can be broken once for around 3 credits, which is something that Shapers haven't really been able to do before without importing it for a large pile of influence. I'd compare these cards to D4v1d, Inside Job, Femme Fatale and Faerie. They all deal with a single piece of high strength ice exceptionally well, but only a few times before a different solution must be found. However, Shaper is the faction with the most tutoring so can consistently find Panchatantra and Deus X/Sharpshooter when they need it, as well as the kind of recursion that allows them to do it again if necessary. Test Run works wonders for this kind of rig. Unfortunately, this is a two-card combo, and one where one of the cards is completely useless without the other. That doesn't mean it won't see competitive play: for every The Twins + Komainu there's a Adjusted Chronotype + Wyldside. But there's a subtler reason why Panchatantra is less valuable than D4v1d or Faerie: Shaper just doesn't have enough high-impact run events in faction, and by that, I mean your Account Siphon and Knifed/Spooned/Forked. If Shaper wants to get into a server then they'll probably want to get in again in the next turn, and that'll use up your recursion pretty quickly if you're going through with Deus X and Sharpshooter. Then maybe The Panchatantra could be the second most popular card about a book about animal fables. This card has obvious synergy with three other runner cards: Gingerbread, Sharpshooter, and Deus X. ---Sharpshooter and Dues X allows you to break any large ice at a discount, provided you have a Panchatantra already installed. This has synergy with Kabonesa Wu: Netspace Thrillseeker, as she can tutor Panchatantras out normally and use her ID ability to tutor out Deus X and Sharpshooter cheaply and repeatedly to break ice cheaply on 1-2 iced servers in the early game, similar to some types of Criminal faction decks. ---Gingerbread synergy can create its very own archetype, however, and its usage is very interesting to me. Gingerbread is not an AI, meaning that all of the shaper's icebreaker mod hardware can affect it and can still be used as your main breaker. A base strength of 2, combined with Dinosaurus, The Personal Touch, and Net-Ready Eyes becomes a base strength of 6. Add Takobi and another Personal Touch, and you will never have to worry about boosting for strength again. Alternatively, you can use Dedicated Processor and Gebrselassie to pay 2 once per turn, (or maybe twice). The flaws with this archetype is that it can only break into 3-deep servers, and any additional ice has to be broken with a backup breaker, (Crypsis/D4v1d), or a conditional backup breaker, (Dues X/Sharpshooter), both requiring additional memory, and which causes it to fall apart to the Vertical Jinja City Grid archetype. In addition, all available hardware tutors are either very expensive or high influence, making this deck slow, inconsistent, and late game preferable. This card has clear synergy with Gingerbread, Deus X, Sharpshooter, and a spoiled card from later on in the Mumbad Cycle. Unfortunately, Gingerbread's base strength and strength increase put it in such that many commonly-seen ICE are overpaid for, due to being at Strengths 3, 4, 6, or 7), and Deus X and Sharpshooter, while extremely cheap to use when breaking, have a high cost in terms of the recursion required, especially given the addition of Clone Chip to the MWL). This means that building a deck entirely around having multiple Panchatantra out will probably run into either money or recursion issues.